In my last post, Post-Latke Barszcz / Borscht, I mentioned uszka, or "little ears." 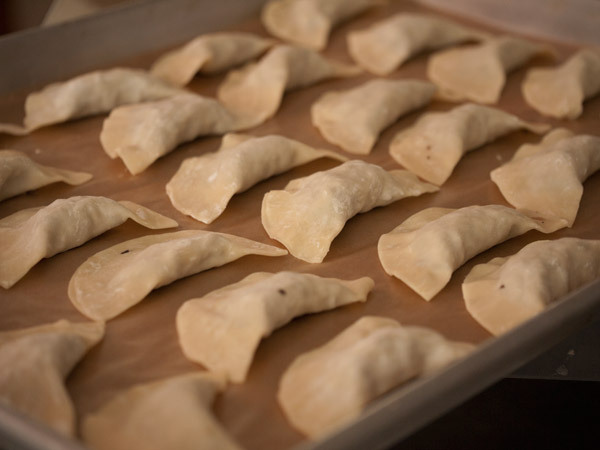 These mushroom-stuffed dumplings are the traditional accompaniment to barszcz wigilijny (Christmas Eve borscht). 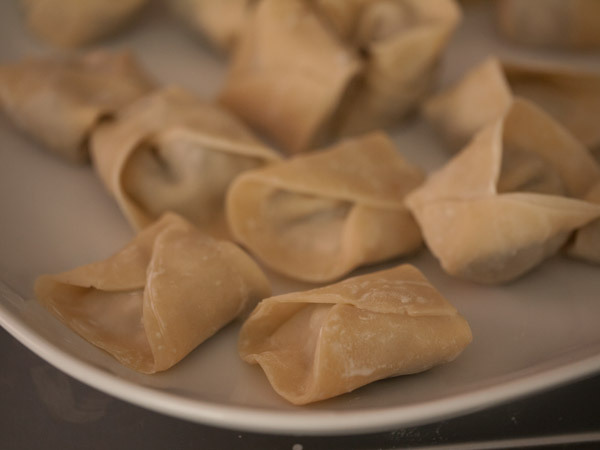 I have this irrational anxiety about making pasta, so instead of making the dough from scratch, I cheated and used pre-made wonton wrappers, available at any asian market. They're not the same; uszka dough is made with eggs, and is a bit thicker, with a different taste and texture. But you know what? They were still tasty. 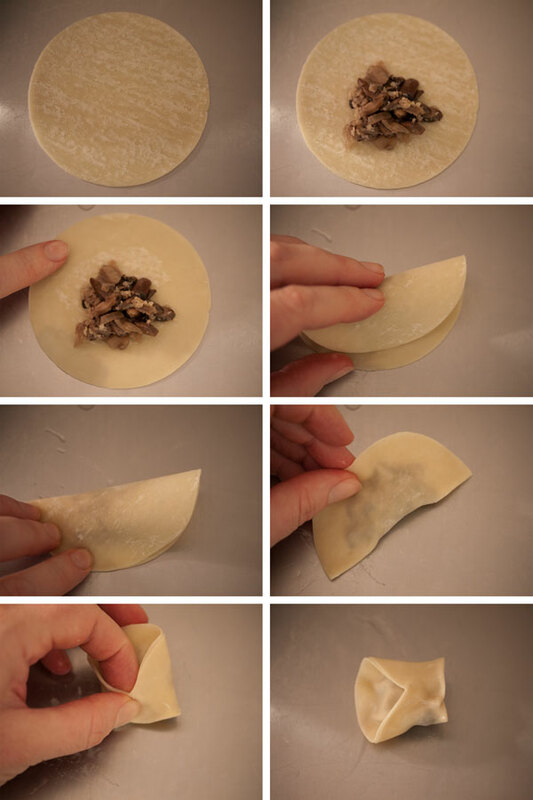 If you use wonton skins, remember to keep the stack covered with a damp towel, because otherwise they'll dry out and crack when you try to fold them. Like the barszcz, I made my uszka with the recipe from Polish Cookery, by Marja Ochorowicz-Monatowa. 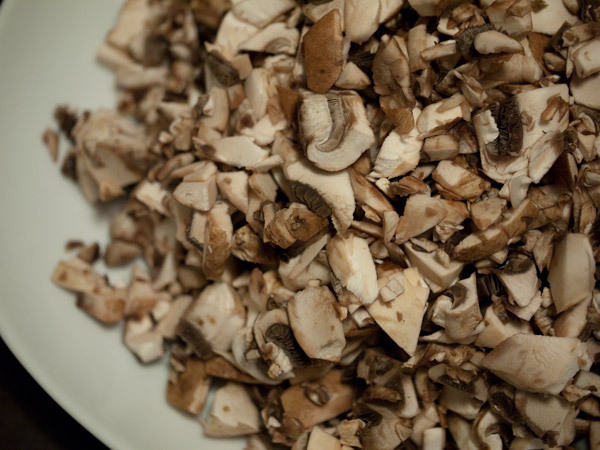 I used a combination of fresh and dried mushrooms, soaking the dried ones in hot water to rehydrate them. 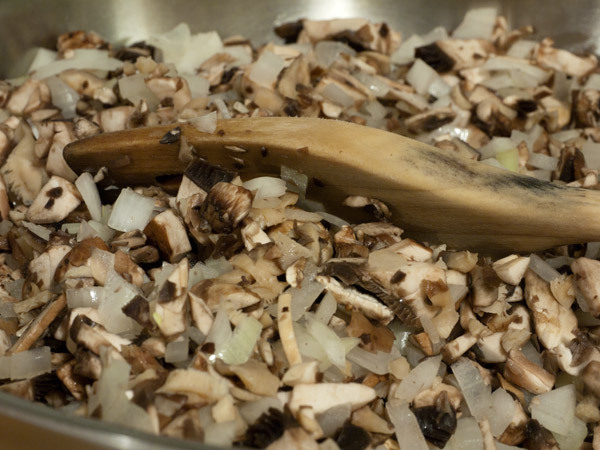 If you do this, add the soaking water to your soup — it's full of intense mushroomy flavor. 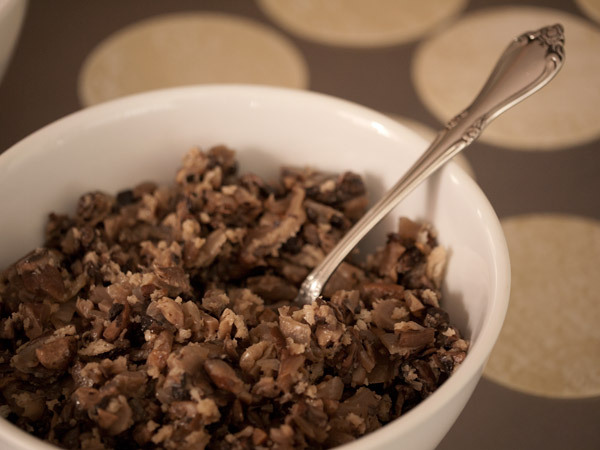 The filling's quick and easy, and you can make it in advance. Just chop the mushrooms, sauté them in butter or evoo with a diced onion, toss in some breadcrumbs (I used japanese panko, but any type would work), and season with salt and pepper. While I used wonton skins, her dough actually sounds fairly simple: 2 cups flour, 1 egg, a few tsp of water. Mix, work until firm, roll out thin, and cut into 3" squares. These might get crowded if you try to cook them in the soup, so most recipes call for cooking them in batches in a large pot of salted water, then adding them to the soup when you serve it. Tip from my mother-in-law is to simmer them; a rolling boil can make the seams come apart. They're done when they float to the surface. Mine (using wonton skins) took about 3 minutes; the book (using homemade dough) claims they take 20 to 30 minutes. I recommend making a few as a test, while you're assembling the rest.